Despite failed trials, Big Pharma continues to invest heavily in ‘cures’ that may not do anything but worsen the disease. For instance, trials of Eli Lilly’s gamma-secretase inhibitor, semagacestat (LY450139), were halted due to below par results. Later, despite reports that results of solanezumab, a neuroprotector that binds to plaque and inhibits its formation, were positive, the company said that it was not going to the FDA for approval, but will conduct a third Phase III trial. The company has already failed three times at creating a “inhibitor that would address this disease effectively. In 2011, Bristol-Myers Squibb tried to develop a gamma-secretase inhibitor (BMS-708163. Test results were less than promising. In 2012, Pfizer announced that it was abandoning further development of intravenous formulations of bapineuzumab, an anti-amyloid antibody, after the failure of its Phase II study. In 2013, Baxter International reported that its immune-bolstering treatment had ended in a failure after trying to create a drug called Gammagard out of components of the human immune system. It also failed at removing amyloid plaques from the brain. A new study looks at intracranial calcifications in the brains of Alzheimer’s patients. After noticing that the brain’s primary structures were negatively affected by calcification, namely the pineal gland, habenula, choroids plexus, superior sagittal sinus, basal ganglia, falx, dura mater, and tentorium cerebelli, as well as the petroclinoid ligaments, a promising new hypothesis was formed. Alzheimer’s patients had highly calcified pineal glands, as do two-thirds of the adult population, and a likely cause of this calcification is fluoride. “Fluoride is likely to cause decreased melatonin production and to have other effects on normal pineal function, which in turn could contribute to a variety of effects in humans.” (National Research Council 2006). Alzheimer’s disease patients are commonly deficient in melatonin levels, likely due to the inability of their pineal gland to produce adequate quantities. The pineal gland is responsible for regulating melatonin and seratonin, which are precursors to N,N-Dimethyltryptamine, or DMT. Melatonin is secreted at night and our pineal gland is aided in this process by sleeping in complete darkness, which is how melatonin production is best synthesized. Our endogenous melatonin levels usually peak around 2 AM, and ceases when the sun comes up. By the time most people are 17 years old, their pineal glands are calcified, thus greatly reducing this gland’s ability to create melatonin. Their pineal glands will often appear as a lump of calcium during a magnetic resonance scan. Calcification is the buildup of calcium phosphate crystals in various parts of the body, a natural process caused primaily by nanobacteria. Nanobacteria are tiny microorganisms that form calcium phosphate shells around themselves, essentially to protect themselves from your immune system. It appears from the latest research that this may be the cause of much of disease. From arthritis, to stroke, from cancer to back pain – and now Alzheimer’s disease. “Fluoride does not accumulate in brain. Of all tissues, brain has the lowest fluoride concentration [Jenkins, 1991; Whitford, 1996; Ekstrand, 1996]. It is generally agreed that the blood-brain barrier restricts the passage of fluoride into the central nervous system. The human pineal gland is outside the blood-brain barrier [Arendt, 1995]. In fact, Alzheimer’s patients have been observed to have a higher degree of pineal gland calcification than patients with other types of dementia, and sleep disturbances have been identified as a primary cause of Alzheimer’s disease pathogenesis, due to the fact that wakefulness increases the the toxic Alzheimer’s disease associated brain protein — amyloid-β (Aβ), known as amyloid plaques – and sleep reduces Aβ. Melatonin has also been known to inhibit the progression of Aβ brain pathology as well as the formation of Aβ protein itself. So while pharmaceutical companies spend billions on ways to stop amyloid plaque buildup, they aren’t looking at the root cause of the calcification of the pineal gland which inhibits melatonin production, which is the body’s own natural way to inhibit amyloid plaques. Reduce halides – These come in the form of fluoride, chlorine, and bromide, all of which come into your body primarily through the water you drink and bathe in. Install a water purification system. Drink only de-chlorinated and de-fluorinated water. Remove pesticides, fungicides, and mercury (from toxic fish primarily), and other toxins from your diet. Only purchase organic, non-GMO foods – It is no mistake that Monsanto and companies like it have invested so heavily in keeping you ‘unrealized.’ Not only do GMO foods cause cancer, but they inhibit the functioning of the pineal gland. Cease the use of sugar, caffeine, and alcohol – They impede the pineal gland’s functioning and add to its calcification. Reduce refined starches – Instead, eat complex starches like brown rice or spelt flour. Reduce stress – Cortisol and Adrenaline, as well as other hormones that are created by the adrenal glands when you are stressed, can interfere with melatonin and serotonin, the sister hormones to DMT, or the pineal elixir that helps us wake up. Stop Smoking – Tobacco smoke is toxic for the body in general, but has extremely detrimental effects on pineal health. This is true of marijuana as well. Drugs like cocaine, heroine, etc. 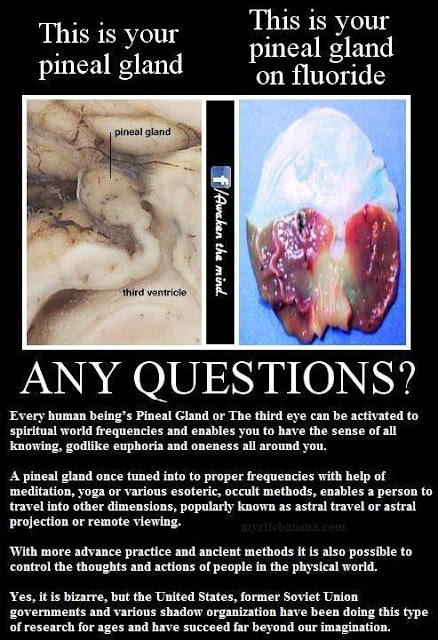 [and many pharmaceuticals] cause the pineal gland to falter. Eat raw cacao – or dark chocolate – Chocolate in its pure form can help to decalcify the pineal gland. Consume neem extract – Neem is one of India’s super herbs. It has been used for thousands of years and purifies almost every system of the body. Reduce meat and dairy consumption. Reduce acidic beverages like soda and energy drinks (also due to sugar and caffeine content). You can also add spirulina, chlorella, and wheat grass to your diet, which greatly enhance the decalcification of the pineal gland. As of May 2000, 42 of the 50 largest U.S. cities had water fluoridation. On January 25, 1945, Grand Rapids, Michigan became the first community in the United States to fluoridate its drinking water to prevent tooth decay. Umm…that’s their job. How else would they make any money if the disease is cured? Hence, why they give you a drug that cures one thing and gives you two or three other things. Gotta feed the Big Pharma beast.